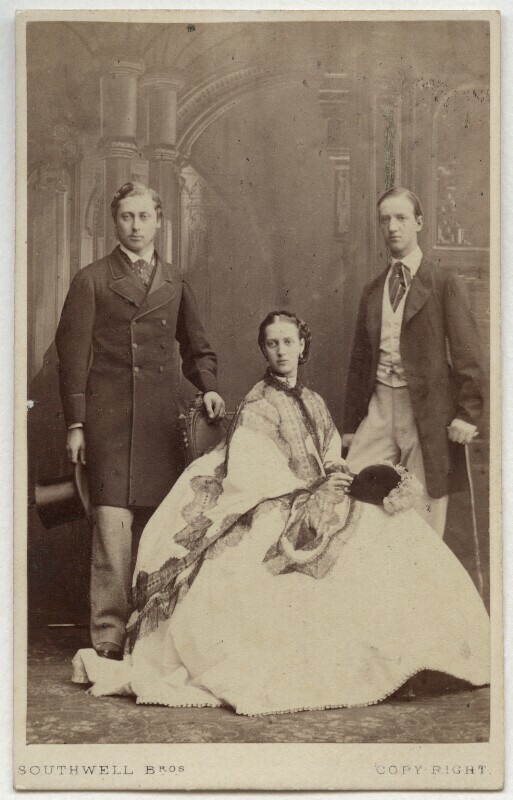 Alexandra, eldest daughter of King Christian IX of Denmark and his consort Louise, married the Prince of Wales (later King Edward VII on 10 March 1863. One of six children, she was closest in age to her brother Prince George and sister Princess Dagmar, forming an intimate group within the family. She is photographed with them both here in the year of her marriage and also that of Prince George's accession to the throne in Greece. Alexandra, popular with the British public, was famed for her elegance and beauty, both factors that made her image suitable for widespread distribution. The sittings and their subsequent publication were reported and praised in the Press. The total series consisted of nine pictures. Alexandra sat for the Southwell Brothers again following the birth of her first child and son, Prince Albert Victor.